I love living in Canada. We have skies that can be free of light pollution with only a short trip outside the cities, and vast areas of land where you can really get away and enjoy the majesty of the cosmos. I occasionally peruse the Canadian made Skynews magazine, and one of my favourite parts is the section where they showcase the work of Canadian astrophotographers. It gives me hope as an amateur astrophotographer myself to eventually get to that level. One of the local Astronomy clubs I visited recently is the North York Astronomical Association, a group of amateur astronomers who are very interested and skilled when it comes to photographing the night sky. I was blown away by some of the images. I was lucky enough to give them a talk about Mars and pick their brains on some of my own challenges with photography. After all of this a few weeks ago, I was pleasantly surprised to see today’s APOD, which is a photo by one of their members, Malcolm Park, taken at their private observatory outside the city. I love this shot because of the multiple parts all coming together. The pale view of the outer edge of our Milky way just left of center, the nebulas of Orion the hunter, the meteors of the Leonid shower, the observatory dome, and the glow of the cities that line lake Ontario. 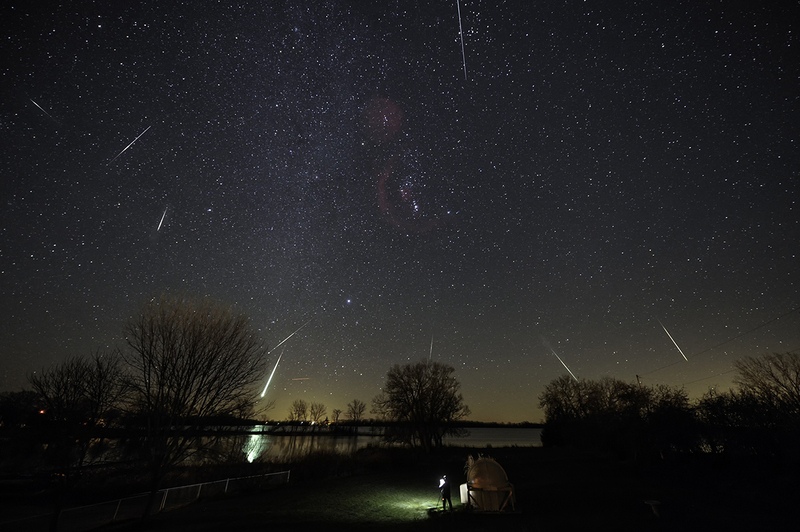 I especially love the bright fireball meteor seen close to the horizon, and the reflection of its light on the water. Amazing how much brighter they can be than the average meteor. Someday I hope to be skilled enough to take a photo that is chosen for the APOD, but before I get there, you can bet members of the North York Astronomical Association will be represented again.